In the distant reaches of the Universe, exploding stars and supermassive black holes are bending the very fabric of spacetime. It’s hard to wrap our brains around such tremendous forces, but we may be able to quantify them, in the form of gravitational waves. A new European Space Agency mission marks humanity’s first bold attempt to do so in outer space. This fall, the ESA’s LISA Pathfinder will be blasted into space on a course for the L1 Lagrange point. Situated nearly a million miles from Earth, it’ll begin pilot-testing fundamental technologies for the detection of elusive gravitational waves. The miniature science observatory bid farewell to the public this week, on display at a test centre in Ottobrunn, Germany for the last time before its long journey. “This is an extremely challenging mission that will pave the way for future space-based projects to observe gravitational waves, opening a new window to explore the cosmos,” LISA Pathfinder project scientist Paul McNamara told ESA News. Gravitational waves, ripples in the fabric of spacetime caused by such cataclysmic events as the merging of supermassive black holes, were first predicted by Albert Einstein in 1915. Unlike electromagnetic radiation, which can scatter off stuff as it travels through space, gravitational waves penetrate through all matter, allowing physicists to “see” back to the beginning of the Universe with minimal interference. If only we could detect them. It takes prodigious energy to give rise to gravitational waves, yet these spacetime ripples are extraordinarily faint. To find them, we need instruments capable of making precise measurements of small distance changes between faraway objects. Ground-based observatories may soon have enough sensitivity to detect them, but these instruments have some inherent limitations. A falling tree or freight train rumbling past will show up on their detectors and make it difficult to see a faint gravitational wave signal. And ground-based observatories are limited to a smaller range of wavelengths. To space, then, researchers are now going. Outside Earth’s gravity well, we can cast a wider net; positioning two objects much further apart than we can on Earth. This will allow physicists to search for gravitational waves over a greater range of wavelengths, increasing our odds of finding them. Ideally, physicists would like a space-based gravitational wave observatory that can watch the distance between two objects a million kilometers (621,000 miles) apart fluctuate by about a millionth of a millionth of a meter. As you might imagine, this is going to be an insanely difficult experiment to set up. So we’re starting small. Artist’s impression of the LISA Pathfinder Technology package, which will perform the first high-precision tracking of two objects in free-fall. The LISA pathfinder mission will be our dry run, testing fundamental technologies for gravitational wave detection in a small, confined space. 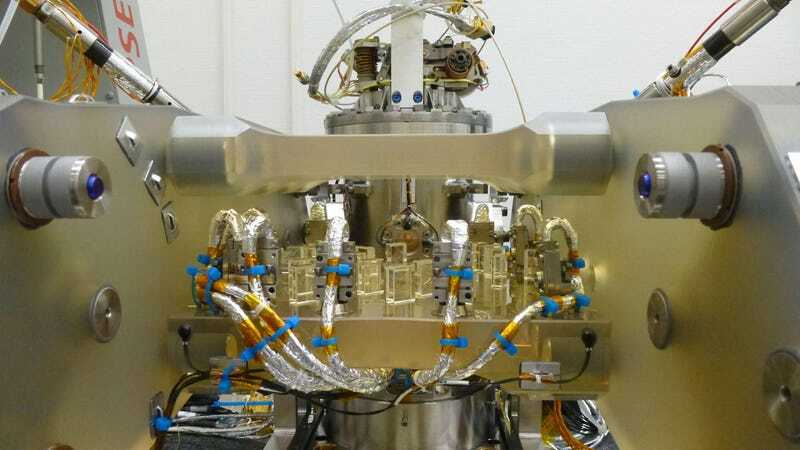 The experiment will drop a pair of 4.6 centimeter (1.8 inch) solid gold–platinum cubes separated by only 38 centimeters (15 inches) inside two electrode housing boxes (which shield the cubes from the effects of the solar wind). The pathfinder will be monitoring the positions of the two cubes as they enter free fall, using a high-precision laser interferometer. It’ll attempt to maintain their relative positions to the level of precision required by a full-blown gravitational wave observatory. If we can do that, we might just get our first little whiff of the spacetime ripples physicists have been chasing for a century. The LISA Pathfinder launches this November from Europe’s Spaceport in Kourou, French Guiana. We’ll be keeping a close eye on it, so check back for updates!